A facelift is a surgical method that removes excess facial skin to make the face appear younger. However, the aging face not only loses skin elasticity and develops looser skin, but also loses fat and muscle tone. Additional procedures that may be necessary to achieve the best results include: neck lift, removal of buccal (cheek) fat pad, forehead lift, and browlift (it is depends) Face Lift is suitable for male and female. During the face lift procedure, excess skin and fat are trimmed away through incisions that separate the skin from the underlying tissue. After surgery, the head and face will be loosely bandaged to help reduce swelling and bruising. During the face lift recovery, patients should allow for adequate healing time and expect some postoperative swelling, numbness, and skin discoloration for about two weeks. How long does this surgery takes? Usually around 2 to 4 hours, but it’s depend. Our surgeon will advise you. 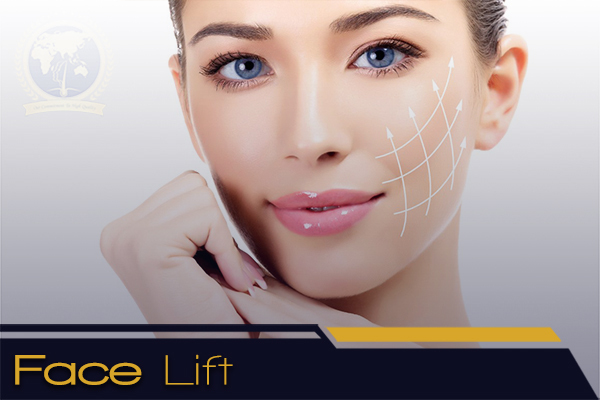 The face lift healing time and recovery period can last anywhere from one week to several weeks, depending on the type of face lift surgery undergone. What can I do after the surgery? All incisions and dressings should be kept dry until the surgeon indicates that showering or bathing is okay. For the first few days, the head should be kept elevated and immobile in order to minimize swelling. Most stitches will be removed in about five days, and the initial face lift results will be apparent soon afterward. Most importantly, because you should ONLY do surgery with a specialized surgeon who is certified. At GLOJAS, our surgeon is an expert and committed to deliver the best result to our patients in order for them to enhance their beauty and gain confidence.